So I took a little hiatus from my blog. I loved the psalms, but truthfully I made my blog a burden not the outlet I was looking for. However, for a little while I have thought a lot about the next subject that I wanted to pick up and write about. So I am going to strike out again, and see what happens. Over the past few months I have been drawn time and time again back to the Gospels, and to Jesus. He is infinitely complex, and beautiful. He is like no one else I have ever come into contact with. So I thought for my next little project I would just blog about Jesus in the gospels. And I thought I would start with Mark, and the calling of the first disciples. There are so many things in this passage, but I will just give what I think are 3 important ones. First, Jesus is the initiator. It may seem like a small observation, but I think it is important for all of us to remember that it is Jesus who pursues us, and Jesus who initiates the relationship with us. Just like Simon Peter and Andrew were not out looking for Jesus, neither were we. Simon and Andrew were just casting their nets into the sea. They may not have even Jesus as he walked by, but he called to them and that made all the difference. He called you too, and that was by grace. Jesus saves you from first to last. As small sub-point notice He chose them in particular. 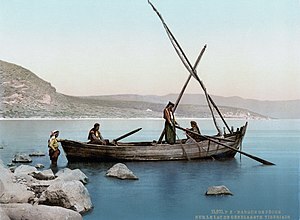 Given that Jesus went just a little further and called another set of fishermen that day, We can feel pretty confident that Simon, Andrew, James and John were not the only fishermen there. Yet Jesus selected these four in particular. If you are a christian, Jesus chose you in particular too. We are not transformed by a list of dos and don’ts, but we are transformed by the love, care, and grace of the Living God. Last, I see in this calling of the disciples that our call is not primarily about us. Two things concern Jesus. 1) that you follow him and 2) that you seek to bring in others to follow him. Jesus was concerned about bringing in as many others as possible. Jesus very call to them was showing that he wanted to build a community that was actively seeking to bring others in. Our call to be his followers isn’t solely about what it does for us, but should also focus on how we can now bring in others. When I was reading this for my own study I had someone ask me, “So if followers are fisherman, then if you ain’t fishing can you really be a follower?” While I stand 100% behind what I just said about rules and Jesus being the one who shapes us, and while I fully recognize that all of us have different spiritual gifts I have to agree that something is wrong if we aren’t seeking to bring others to Jesus. Either we aren’t following him, or he isn’t important enough to us to tell other about. And I would say that if you think the latter is true then the former is probably as well. I don’t write this to place guilt on anyone (all three of you who will read this). I write so that if it is not true of you, that you do all that you can to come into closer contact with Jesus. That you ask him to reshape you so that you will have a desire, and passion to see others follow him. I know that is my prayer for my life. I pray that my walk with Jesus would radically change my outlook, and love for other people. I want to be reformed and reshaped by Jesus. I want to follow him because I know that is where life is found. So that is what I think, what do you think? Earl, I couldn’t agree more and I think back to my first personal experience with Jesus and how I couldn’t stop myself from telling others…family, friends, and strangers. Over the years, my relationship with Him has grown deeper, but I have become too distracted by life and sometimes church involvement to actively look for opportunities to share as much as I want to. Praise Him for His faithfulness to accomplish His will even thru our inabilities…that He doesn’t ever give up on us or consider us “useless” for His purposes, but refines us and refocuses us when we turn our hearts to Him. I don’t know what my future holds, but I know that I want to go thru my days speaking out about Jesus…His truth, His grace,His love. Thank you, Earl, for words well spoken to focus my eyes on the throne of Heaven.